India's former chief film censor, Anupam Kher, has filed a defamation lawsuit against the leader of the Communist Party of India (Marxist). He is angered by comments attributed to Harkishan Singh Surjeet, who allegedly labelled him a Hindu right-winger. Mr Kher was sacked as chief film censor last week, two months after he refused to approve a film about riots in Gujarat state. The film, Final Solution, covers the Muslim-Hindu riots of 2002. 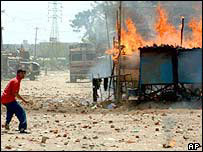 More than 1,000 people, most of them Muslims, died in the riots. Mr Kher warned last week that he was considering filing a defamation lawsuit against Mr Surjeet for reportedly calling him a member of the right-wing Hindu group, the Rashtriya Swayamsewak Sangh (RSS). "I may not win it but it is important to tell him that he cannot make such irresponsible statements," said Mr Kher, who is also a Bollywood actor. "This is an effort to malign me and question my integrity. Today I stand alone to fight this injustice." Mr Kher said he was also "seriously thinking of filing a case against the government's decision" to replace him as the Indian Film Censor Board chief. Am I some kind of a poison? Have I ever campaigned for the BJP? The Congress-led federal government replaced him last week with actress Sharmila Tagore. Mr Kher said the manner in which he was asked to step down was "shameful" and he was "angry, hurt and disillusioned". He said: "There is no reason for this government decision. They thought I was close to the Bharatiya Janata Party. Am I some kind of a poison? Have I ever campaigned for the BJP?" 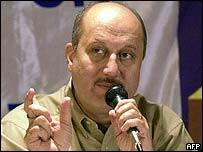 Mr Kher was appointed by the BJP-led coalition government last year and his tenure had two years to run. The BJP came in for heavy criticism from human rights groups over the treatment of Muslims by the Gujarat state authorities during and after the riots. The federal government gave notice last Wednesday that a new chief censor had been appointed. It did not say why there had been a change. Congress party spokesman, Jayanti Natarajan, said it was the BJP, and not Congress, that believed in "cultural policing". The BJP says Mr Kher's sacking is part of a Congress political vendetta. Experts say Mr Kher's removal is simply an example of how those appointed by a previous government are replaced by a new one. Mr Kher banned Final Solution on 6 August, saying it was "highly provocative and may trigger off unrest and communal violence". However, the censor board subsequently reversed that decision. The film follows the riots that broke out after 59 Hindus were killed in an arson attack on a train in February 2002, blamed on a Muslim mob. It won the documentary and critics awards at the Hong Kong International Film Festival, and the Wolfgang Staudte and Special Jury awards at the Berlin International Film Festival.